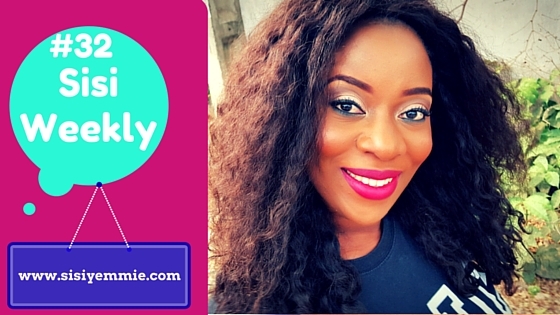 LIFE IN LAGOS : SISI WEEKLY EP. 32! "TIME TO TESTIFY"
Welcome to the month of February!!!! Sisi Weekly 32 is here! I know I have a lot of new readers and some of them don't know what happened in 2014, that was an epic year for me and i think it was majorly because of my 100 days RCCG fast! I really want to go to Church and testify but I'm so shy but I decided to share it on my vlog...where it can reach everybody and anybody! Win-Win!!! If you're not SUBSCRIBED, PRESS HERE to jump on this moving train oh! Thank you for always watching! Saw testimony on my reading feed and just rushed down here. Thanks for sharing your testimony Sisi, God works in mysterious ways. I started watching My Big Nigerian wedding last year. I think Africa magic started showing it again after your wedding but didn't continue or something. When I saw you there, I picked up my remote and just scheduled to record the whole season so I don't miss anything but somehow maybe the programme didn't continue or someone cancelled my recording. Sleeping at 3 am and waking up at noon and dropping Tito at the creche by 3pm is #ALLNOTHELPINGYOU. Tell yourself when you want to go to bed and whether you finish or not, leave everything, shut down, drop the phone, pray and go to bed else it will just continue that way. Try your best to drop Tito at the creche latest say 10 or 12 noon so you have like 6hours to yourself before picking him up ok. He is growing and one day you'll have all the time to rest. Blogging takes time and has no end. You can never be satisfied that you have done all you need to cover in one day, turn a blind eye, go to sleep latest by midnight so you can wake up in the morning and you'll see how that helps. I take God beg you my sis, let your day start in the morning not afternoon oh. God will help us. Your Vlogs are real and entertaining. Keep going. This 2016 is going to be your best yet. I'll be taking from this advice. Thanks for sharing, Aunty Eya! You go fear refreshing na. Dear Sisi, na from clap e dey enter dance o. Like joke like joke, now now now now, this your weekly videos don de become essential. I so look forward to them. I stay in the US and your videos make me so homesick. All the places I haven't seen in almost eight years. The best part is how natural you are - absolutely no forming. Wishing you the very best and you have the cutest little family unit. For real, if you need something from this part of the world, say beauty product or health product, holla at a sister and imma hook you up for free. Just to say thank you for putting a smile on my face. I loved seeing those women in the market... they know their crafts mehn! The only exercise Nigerians like doing is jumping into conclusions... hahahahaha. Sisi, you are so funny. But people eh, they'll just conclude about you without even knowing you. Thank God Bobo is better now. That fasting testimony is so inspiring. Have a blessed new month. oooooh! every time, everytime,vlog! abeg have mercy on d data of the massess na. add a transcript or something...great job u doing sis. oooohhh! have mercy on d data of the masses and add a transcript or something..great job sis! Watch out Sisi Yemmie, 2016 will be another blockbuster best year yet. I enjoyed this vlog sisi!I have an oha recipe on my blog and it's very easy anyway.I din't know they sold already ground achi.I always grind mine when i want to buy.I watch the vlogs late but i always enjoy them. Lovely video Sisi, God is ever faithful and 2016 will be a great year for everyone of us IJN. I want that stew and fried fish. How did the Oha preparation go? I hope u enjoyed the market, on one of ur social media handle u mentioned it was the first time in market in 7months. Me as an AKAGLUE, I always find a means to go to the market, I have patronized one of these online market, but by the time I saw service fee of 2k I ran. Thank God Bobo is okay now.I pray and hope to share a testimony like your's one day.God will endorse all our pending requests.Hi Titobs and Uncle J.
Sisi Yemmie I have to say that it was after I saw you do the 100 days fast and declare, I was pushed to do the 21days dry fast in 2015 and now 50days in 2016!!! Can't wait for my testimonies this year simple: Life Purpose. Life partner. Complete healing !! !